Heat oven to 400°F. Grease pie plate, 9x1 1/4 inches. Mix crabmeat, cheeses, onions and pimientos in pie plate. Stir remaining ingredients in bowl with fork until blended. Pour into pie plate. Bake uncovered 35 to 40 minutes or until golden brown and knife inserted in center comes out clean (some cream cheese may stick to knife). Let stand 10 minutes before cutting. Pimientos are red peppers that grow very much like the more common green bell pepper. These versatile peppers are of the sweet (versus hot) variety. They are commonly sold in jars, stuffed in olives and dried and ground to make paprika. Instead of the frozen crabmeat or shrimp, use either a 6-ounce can of crabmeat, drained and cartilage removed, a 4-ounce can of shrimp, well rinsed and drained, or a 6-ounce can of tuna, drained. Make it Impossibly Easy Tuna Pie when you use a 6-ounce can of tuna, drained, instead of the crabmeat. 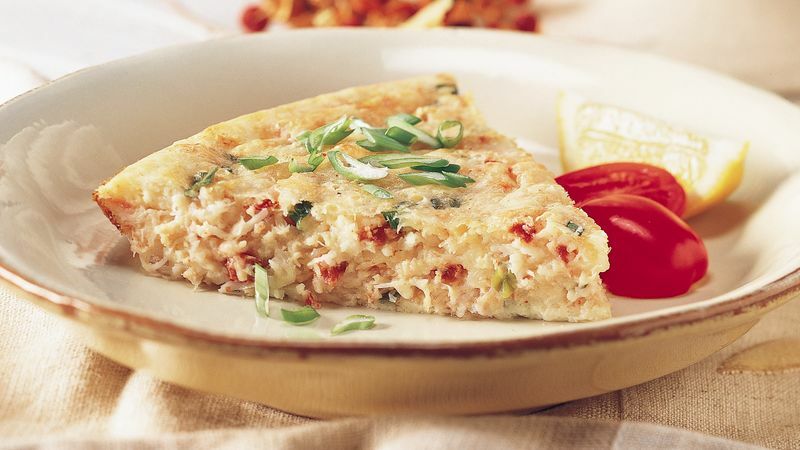 If you keep canned crabmeat or shrimp on hand, go ahead and use it in this easy dinner pie.